Real Murcia Baloncesto (LEB Silver) inked 24-year old Nigerian international forward Tosin Mehinti (206-108kg-94, college: UAB). He played most recently at GS Lavrio in Greek A1 league. In 6 games he averaged just 2.7ppg and 1.5rpg last season. 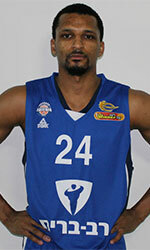 Mehinti also played for Horsholm 79ers (Ligaen) in league where in 11 games he had 13.5ppg, 5.8rpg, 1.3apg and 1.3bpg. His team won C-USA Regular Season in 2016. Mehinti was called to Nigerian Senior National Team this year. He graduated from University of Alabama at Birmingham in 2017 and it will be his second season in pro basketball.